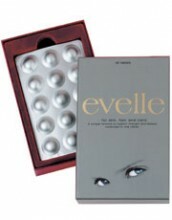 Evelle is a unique combination product for skin hair and nails. It contains a number of potent antioxidants, vitamin C, vitamin E, tomato extract, blueberry, selenium and Pycnogenol. Also present are Marine complex- chondroitin sulphate, biotin - a member of the B-vitamin family, the herb horsetail extract and Zinc. As we age our skin looks more worn and dull, lines appear and sagging may occur. The root cause of these changes occurs in the underlying layer of skin called the dermis. The dermis is made predominantly of collagen, which acts as support to the outer layers of skin. As we age there is less collagen produced. A gradual breakdown in microcirculation leads to these cells not receiving the amount of nutrients they need. To add to this the skin also loses the moisture containing cells. Aspects of modern life also compound to this. Excessive exposure to the sun can lead to premature aging. Antioxidants present in Evelle may help to reduce damage caused by ageing and exposure to oxidative stress. Biotin (also known as Co-enzyme R) is important in the process known as ‘cell division’. The body needs sufficient levels of this vitamin to help maintain healthy skin, nails and hair. The use of Zinc for wound healing has been documented over 3000 years. The herb ‘Horsetail extract’ contains silicon, which the body can use in the formation of collagen. Pharma Nord recommends two tablets of Evelle daily. We would not recommend that pregnant women take Evelle. There are no known drug interactions or contra-indications for Evelle. Click the button below to add the Pharma Nord Evelle 60 tablets to your wish list.